You are here: Home > Blog > Flora & Fauna > SOS: Save Our Sedge – woodland plants in decline? A worrying decline in native woodland plants has been highlighted in the news this week by the conservation charity Plantlife. The Government-funded Countryside Survey has found that, although England is now less intensively farmed than ten years ago, wild plants and animals are not doing as well as might be expected. Britain has lost the equivalent of 16,000 miles of hedgerow or 6% in the last ten years. 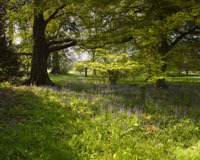 Plantlife are particularly concerned about the effects of unmanaged woodland on plants such as bluebells, campion and violets that thrive in open glades. 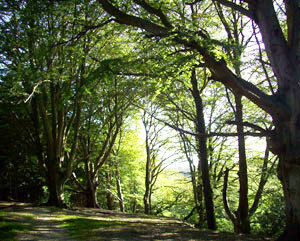 The decline in timber production since the end of the Second World War has meant many woodlands have lost their original purpose and become overgrown. Where woodland was previously worked, paths cleared, areas coppiced and timber felled, creating open, sunny glades, these open areas have gradually closed in again and become dark. In a collaboration between Plantlife and Charterhouse School in Surrey, plans are being made to reintroduce one of Britain’s rarest plants. Starved Wood-sedge, a delicate grass-like plant with flowering stems, used to be common in the School’s woodlands. It is said that many of the estate workers who once worked the wood left to fight in the Second World War. After the War, few returned or wanted to work on the land, and the woods became overgrown and dark. Having lost its sunny glades, the Starved Wood-sedge soon vanished. Not a single plant has been discovered in the past 60 years. It is now so rare it is known in only two locations, another location in Surrey and in Somerset. Plantlife hope to give it a fighting chance by working with Charterhouse School to reintroduce it to one of its original locations. Dominic Price of Plantlife says, "Some of our most endangered plants live in woodland but they need quality managed woodland, not overgrown forest that is being neglected."